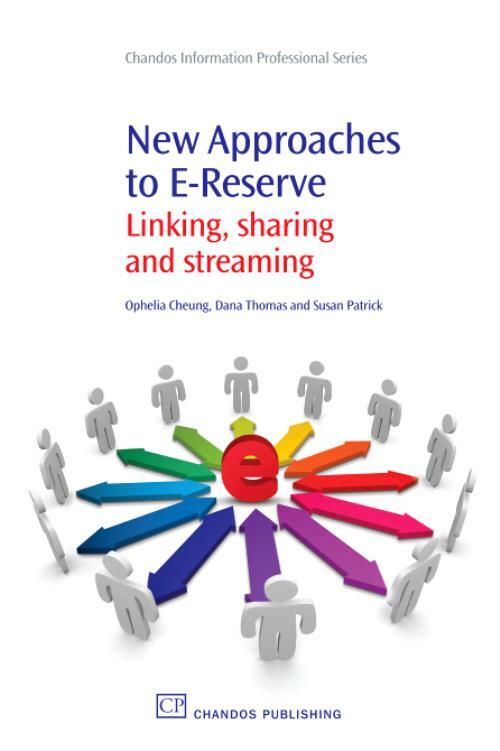 Aimed at academic library practitioners, this book describes how e-reserve services can evolve and adapt to the changing virtual learning environment of higher education. New approaches discussed include: the integration of subscribed, free, and copyrighted resources within course management systems; innovative employment of open URL link resolvers to connect e-reserve with library e-resources and services; video streaming within course documents; and the creative use of bibliographic software to produce customized reading lists. New Approaches to E-Reserve includes detailed descriptions and extensive step-by-step illustrations in order to provide readers with the tools needed to implement the techniques covered within. These combine to offer practical insight into common issues faced by academic institutions worldwide. In addition to an overview of practices and an update on new developments in e-reserve, a discussion of strategy, policy and organizational change extends this book's relevance to a much broader theme: the strategic management of current and future technological changes in tertiary education. how software designed for other purposes can be adapted or utilized; New digital media formats: Streamed video; Challenges and issues; Possible strategies: Collaboration, integration and interaction are the keystones for survival or expansion of e-reserve service. Cheung, OpheliaOphelia Cheung has a BA in English Literature from the University of Hong Kong and a Masters of Library Science (MLS) from the University of Western Ontario in Canada (1978). She gained experience in both academic and special libraries in Hong Kong before joining Ryerson University Library in Toronto, Canada in 1985. Since then, Ophelia has assumed responsibilities in reference, collection development and library instruction. Ophelia was the Head of Information Services, Audio Visual and Interlibrary Loan Manager, and is currently supervising E-Reserve and Audio Visual services. She has implemented organizational changes and new initiatives in these areas. She has contributed to peer-reviewed library science journals and presented at international library and information technology and e-learning conferences. Thomas, DanaDana Thomas has been an academic librarian since January 2005. Within collections services, her responsibilities have included managing Ryerson University Library's serials and electronic resources collections, including acquisition and technical support. She has also been responsible for subject liaison and collection development work, provision of reference services, and library instruction. Located in Toronto, Ontario, Canada, Ryerson University is part of the Ontario Council of University Libraries (OCUL) consortium which supports the provincial Scholars Portal project. Dana is primarily responsible for SFX and RefWorks at Ryerson, two of the services implemented across the consortium. In this role, she has been invited to present at Scholars Portal events and is a member of a Public Services Advisory Group which facilitates user-driven evaluation of Scholars Portal services. Her research interests focus on usability of academic library resources, and how changes in technology and library resources relate to research behaviour. Currently, Dana is on secondment at Scholars Portal as Evaluation and Assessment Librarian. Patrick, SusanSusan Patrick has a BA (Major in English) from McGill University in Montreal, Canada (1972), a Graduate Diploma in Library Science from Queensland Institute of Technology in Brisbane, Australia (1976), and a BA (Honours FineArts/Film) from York University in Toronto, Canada (1985). She has worked as an academic librarian, beginning at the University of Queensland Library in Brisbane (1976-1980), and then at Ryerson University Library in Toronto (1980-83, 1989-present), where her experience has been mainly in the areas of reference, collection development, and library instruction. She was Audio Visual Librarian from 2003 - 2006, and is currently Special Collections Librarian. She has contributed to peer-reviewed library science journals and presented at international library and information technology and e-learning conferences.